Are you finally about to let off some steam and come back down? Everybody has been talking about this market correction but until last week you’ve been awfully stubborn and just keep inching higher. It’s now April 8th, so albeit a few weeks early, can we at least ask you about this whole “Sell in May and Go Away” concept? For those that may not be aware of the old Wall Street adage, “sell in May and go away”, it is a belief that the market performs better in the months of November to April. Those that follow this strategy ideally sell their stocks in May and stay in cash until about Halloween. Does this have any merit? We wrote about this last year and wondered if it was once again data mining and essentially a statistical fluke. Analysis by Ben Bouman and Sven Jacobsen (2002) actually confirmed about 10% percentage points of stronger performance in 36 of the 37 markets they studied for the November-April time period. These results were more pronounced in the European economies. Other studies also point to the Dow Jones averaging about a gain of 7.5% in the Winter months while the Summer months lost 0.1%. There are a number of factors on why this trend seems to have been fairly reliable dating all the way back to 1950. Year-end bonuses and the proverbial “Santa Claus rally” can sometimes help bump the markets up in the Winter months. Barring any unexpected negative catalyst and a typically mild Spring, the “summer doldrums” set in after all the first-quarter results are announced. Like it or not the extensive media coverage can really amplify an earnings miss or a hit and it’s not inconceivable to see a company drop or rise by 20% during this time. Today will bring us Alcoa Inc.’s results and officially kick off the earnings season. The risks of a correction have clearly increased throughout each week of 2013. We’re now at a point where if you’ve had the good fortune or solid guidance to have participated in some of the rising market, it might be an opportune time to take some profits. 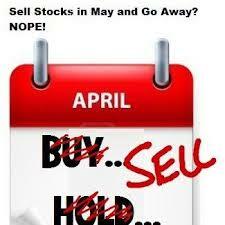 We’re thinking “sell in May and go away” is coming early in 2013 as it has the past couple of years. Perhaps this is partly a self-fulfilling prophecy and it may actually amplify a welcomed 5% pullback into at least a 10% correction and possibly more. Many folks who have been pounding the table since last October that the market was going to collapse have likely not been in it and missed much of the upside. Since they have been flat out wrong up to this point, maybe now is a decent time to take some action. We try our best to avoid “timing markets” as it’s constantly proven to be a futile endeavor. Stick to your proposed allocations over the long haul but along the way there are instances where it makes sense to take a little off the table. We believe now is one of them and even if it’s relatively minor equity reduction of even just 5% off in Large, Mid, Small, and International equity exposure…it could be the wisest move you make all year. If the market runs higher, it’s unlikely to go too much further until Fall. If they do indeed dip down you’ll have some cash to deploy towards a shopping list of stocks that are cheaper than they finished in Q1. Either way…. although not always realistic but in this case correct, “You don’t go broke taking a profit”. This entry was posted in Behavioral Finance and tagged Alcoa, Dow Jones & Company, Halloween indicator, May, Mr. Market, Santa Claus rally, Wall Street by Matt@DearMrMarket.com. Bookmark the permalink.